Luli fama started off in 2003 and has taken flight in the swimwear industry since then. The fashion show revealed some amazing pieces created for Miami by the Designers in MBMFW 2015. 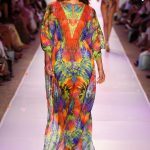 Luli Fama, a popular brand in the swim wear fashion industry, went complete Miami frenzy with their new collection of swim wear at the Mercedes Benz Miami Fashion Week 2015 in Cabana Grande. Their collection theme was “Miami Nice” showcasing everything there is to talk about Miami. Even the ramp walk song collection spoke complete Miami featuring the audio of Gloria Estefan & the Miami Sound Machine. The creators of the brand Lourde “Luli” Hanimian and Augusto Hanimian have always been interested in designing the best swimwear Miami has ever seen. At the Cabana Grande the duo proved themselves the best by showcasing complete Miami styled pieces embellished with crochet, knotted net, braiding and tassels. The ramp unveiled glamorous beauties all covered in stylish swim suits rich in tropical and zig zag prints, paisley and splashes of gold and pastels inspired by the Miami Vice TV series. The show was extravagant and enchanted the audience with a true music of Miami and its Beach flavors all coupled with hot swimwear styles for the best fashion customers.